07 Feb 2019 --- A new report by Fruit Logistica anticipates “significant innovation” in fresh produce packaging and supply chain management in the coming years. This prediction is based on increased consumer awareness of the environmental damage caused by food packaging and the need for greater shelf-life and efficiency in the supply chain. “Packaging is currently in the news. Increased awareness about the environmental impact of plastic packaging has placed it under the scrutiny from environmental pressure groups, and the reality is that fresh food retailers are already responding to this challenge,” the report reads. “Some even say this growing concern should be welcomed, as it adds increased impetus to resolving the challenges of the present generation of packaging,” it states. The report highlights that packaging for easy-healthy, fresh convenience products often break easily, meaning that the produce can then leak into a customer’s bag. The packaging also often fails to reduce quality deterioration adequately. “The current nature of supply chains adds to the problem, with lengthy times spent in transit leading to loss of product quality and nutritional value. All of these factors result in short shelf-life and high levels of waste,” the report continues. “Firstly, while minimizing the overall use of plastic, we expect to see increased use of recycled plastics in the packaging of easy-healthy convenience products. 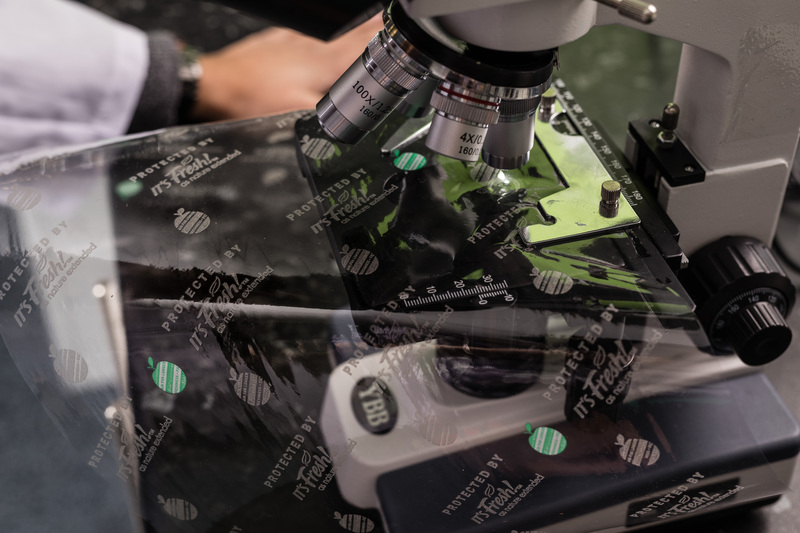 Secondly, we expect the introduction of modified production processes in combination with new forms of stable packaging, including packaging within a protective atmosphere. Fruit Logistica expects these new sources of supply to not only reduce transportation distances and supply times but also to fulfill emerging expectations of proximate locality. In combination, these innovations will improve quality and greatly increase shelf-life. One such company innovating to improve fresh fruit and vegetable shelf-life is UK-based technologists, It’s Fresh! The company’s latest shelf-enhancing product, Infinite, is a new sustainable delivery system that utilizes a proprietary “active ingredient” that can be printed directly onto existing packaging for fruit, vegetables and even flowers. It is proven to prolong shelf-life and extend freshness and quality by absorbing the natural ripening hormone, ethylene. “The packaging of fruit & veg is a sophisticated and highly skilled industry, it does not exist merely to increase real estate for marketing purposes, but to protect and maintain freshness and quality during its journey through the supply chain and into the home,” Simon Lee, Co-Founder, It’s Fresh!, tells PackagingInsights. “Without a mechanism to control the deterioration of freshness and quality, much of the fruit & veg we consume will be picked, packed, shipped, stored, merchandised and wasted before we have time to eat it,” he says. “With Infinite, It’s Fresh! are not only ensuring that we can make use of the existing sophisticated packaging that successfully protects our fruit & veg by making it even more functional and purposeful, but we are also ensuring that our finite precious resources within the supply chain aren’t wasted as well, including water, labor and energy,” Lee adds. Infinite will be trialed by its launch partner, Morrisons, in 2019. Like all other It’s Fresh! products, it will be available globally after the trial period. Waitrose, Carrefour, Walmart, Albertsons and Safeways are just some of the big supermarkets already making commercial use of It’s Fresh! technologies. Most commonly, a postage-stamp sized filter that sits in the packaging of fruit and vegetables to increase shelf-life. 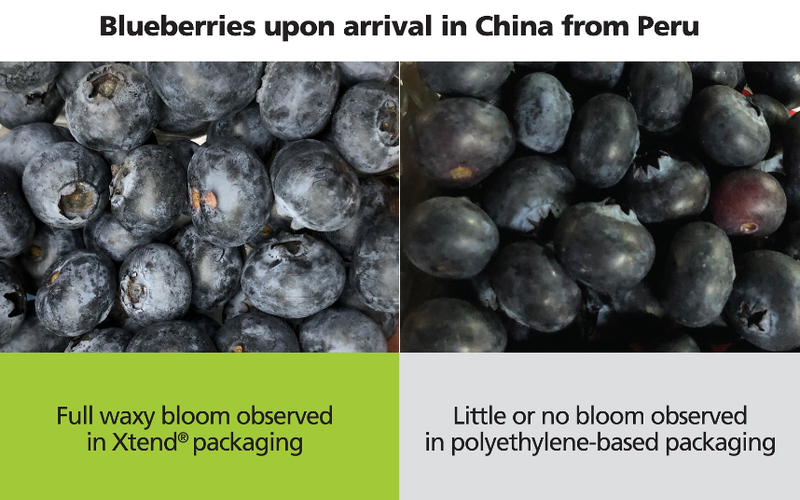 Fresh blueberries, traveled far Click to EnlargeStepac's polyamide-based packaging technology extends blueberry shelf-life by keeping the natural protective bloom intact. In December of last year, fresh produce packaging supplier StePac announced that it had developed proprietary, polyamide-based packaging technology for ensuring long-lasting freshness in long-distance bulk deliveries of blueberries. The new multi-layered packaging coined Xtend is the result of several years of R&D and ensures that the high-value fruit arrives in wholesome condition, with its natural protective bloom intact – the natural powdery white wax on the surface of the fruit which innately protects the fruit and reduces evaporation. The Xtend packaging solution enhances the consumer experience and safeguards retailers against waste, notes the company. This resolves the common challenge faced by growers and exporters (mainly from Chile and Peru) who conduct long-haul shipments to faraway countries, such as China. The reported result is that blueberries shipped in Xtend packaging arrive at their destination, with the full freshness reaped upon harvesting, even after 35 days. According to Dr. Gary Ward, Technical Development Manager, StePac, blueberries are often packed in polyethylene-based modified atmosphere packaging which minimizes weight loss due to its very low water vapor transmission rate (WVTR). “This is important, but the advantage of reduced weight loss is outweighed by the disadvantage that condensation will inevitably form and become trapped in the packaging. This free moisture is an enemy of the natural bloom and is highly likely to be washed from the surface of the blueberries making it less appealing to the eye and, in fact, increases the risk of decay,” he notes. “The preservation of natural bloom is a far more important parameter than slightly lower weight loss. It is the outward indicator of freshness and translates into higher prices for blueberries in the Chinese market,” Ward adds. Last month, Stepac launched a variation of its Xtend range for fresh fruit to be compatible with both automated bulk and retail packing lines. This move facilitates the use of substantially leaner packaging films, with multiple benefits such as extending fresh produce shelf-life, minimizing food waste and reducing the use of plastics, making for more environmentally responsible “green & lean” packaging, the company describes. Prior to Xtend, the manufacturer also launched Xflow, a flowpack solution for blueberries as a cost-saving alternative to traditional preformed bulk packaging. Hamburg Süd is currently exhibiting its new Remote Container Management (RCM) at the ongoing Fruit Logistica show in Berlin. 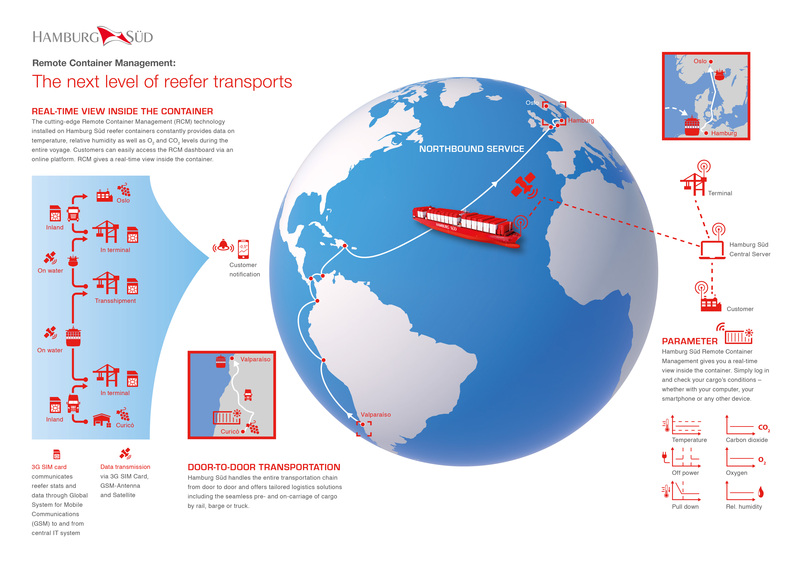 Using satellite and mobile radio technology, RCM makes it possible to monitor the refrigerated container and the condition of the cargo inside it – including its location, temperature profile, relative humidity, and concentrations of oxygen and CO2 – around the clock and in real time. In addition, certain settings can be adjusted remotely. Unlike the monitoring systems previously in place, customers can now use an online platform or an app on their tablet or smartphone to conveniently obtain an overview of the conditions of their cargo in the container at any time. In addition, they are automatically notified when individually defined parameters or limit values are reached.